This page may only be viewed by prospective purchaser(s), users are forbidden to reproduce, republish, redistribute, any material from this document in either machine-readable form or any other form without expressed permission by owntheholyland.com. This agreement and the conditions and details specified in the appendices are binding on the seller and on the buyer(s). In case of a conflict between the documents, Appendix 3 (Terms and Conditions stipulated prior to purchase on OwnTheHolyLand.com) will prevail. The signature of the buyer to Appendix 1 constitutes the acceptance of the buyer to all the terms of this agreement and the and the appendices. The seller hereby sells, transfers, and assigns to the buyer interest and rights in the land specified as above. The purchase price includes taxes payable on the agreement in respect of value added tax, property tax (in the event that there is such payable) legal and other expenses connected with the sale. The seller undertakes to be responsible for taxes and other impositions relating to the ownership and management of the land and to ensure that all payments due are made in a timely manner. The parties agree that all the conditions and stipulations contained in the appendices shall apply fully to this agreement. This Settlement Contract is written to affirm that the Seller (O.T.H.L. Israel Ltd.) has agreed to sell, and the Buyer(s) has agreed to buy via contract between the parties, interest and rights in land that the seller owns. The buyer(s) interest in the land is assigned and identified in Appendix 2. This contract is governed in accordance with the Terms & Conditions that are stipulated upon checkout prior to purchase on OwnTheHolyland.com. The Terms & Conditions are part of this contract in the form of Appendix 3 and will prevail if there will be any conflict between the documents. Fractional Ownership via Contractual Right is in accordance with Jewish Law, and is beneficial in receiving merit for the performance of the agricultural commandments. Upon submission of the completed Contract and the attached Appendix forms, O.T.H.L. Israel Ltd. will issue permanent digital PDF corporate certificates via email to the designated parties identifying their unit(s). “O.T.H.L. Israel Ltd.” affirms it will incur all future associated expenses pertaining to land utilization and management as per Terms & Conditions. “O.T.H.L. Israel Ltd.” affirms that it will under Rabbinic Guidance, assume all responsibility and costs of keeping and maintaining the land in accordance with the laws of Shmita, Orlah, and Terumah. Primary buyer will provide a copy of a State or Government issued I.D. Primary buyer, as part of the closing process, will sign and provide completed documents contained herein. By signing this form, the buyer designates said corporation and or their representatives to act as agents on their behalf, in the performance of the agricultural commandments contingent upon land in Israel. 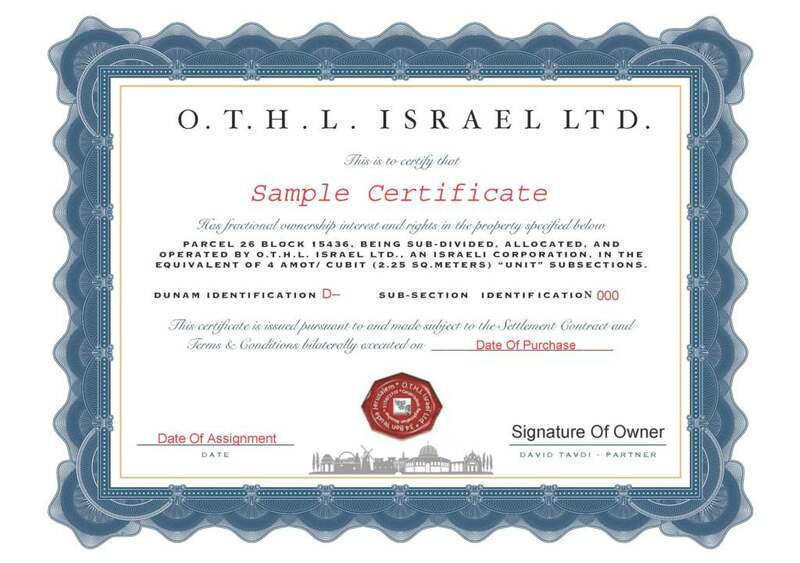 The primary purchaser assignor hereby transfers their contractual rights to the assignee(s) below and authorizes O.T.H.L Israel Ltd. to issue company certificates as designated below. Israel Parcel 26 Block 15436 Northern Israel. (In this section we will issue specifics regarding your land ownership interests). Upon submission of form Appendix 2 and designation of certificate holder(S) O.T.H.L Israel Ltd. will issue Permanent Corporate Certificate along with all counter signed documents within 7 business days clearly identifying unit(s) per certificate holder. 2.1. Buyer(s) are purchasing fractional ownership interest and rights in land owned and operated by O.T.H.L. Israel Ltd. via Contractual Right (Contract between the parties) in the equivalent of a 2.25 square meter sub-section of a Dunam, or a multiple thereof. Buyer(s) will receive a Corporate Certificate(s) clearly identifying the specifics and location of the land, as well as unit(s) purchased, upon execution of the Settlement Contract. Fractional ownership via Contractual Right is in accordance with Jewish Law, and is beneficial in receiving merit for the performance of the agricultural commandments. O.T.H.L Israel Ltd. retains the right to sell the land in the future. In the event of sale, all purchasers will receive a full refund or alternative interest and rights in an equivalent piece of property. In the unfortunate event of the buyers death, any and all Certificates and Contracts will be transferable to a direct family member at no additional cost. A valid probate order shall be required. O.T.H.L. Israel Ltd. assumes, for the benefit of the buyer(s), all responsibility and expenses for hiring employees, paying annual property taxes, plowing and clearing the land, planting, purchasing and installing water lines, irrigation systems, payment and management of water use, treatments against infestation, regular fertilization, and all other acts necessary for up keep of the land. O.T.H.L Israel Ltd. will assume all the responsibilities for complying with the laws and regulations associated with the commandments of Terumah, Orlah, and Shmita by appointing a Rabbinic Authority or Organization which is well versed in all aspects of Jewish Agricultural Law. In the efforts of keeping this opportunity economical, it is understood by the buyer(s) that they waive any claim to the yield of the land. A permanent digital PDF corporate certificates with a unique identification number corresponding to the specifics and location of the land, will be issued via email after execution of the Settlement Contract. In the event demand and orders exceed our supply of land, we allow our- selves 6 months to purchase and close on additional land, so as to fill those orders. Buyer(s) assume no liability in any event.